The Pacific Community (SPC) was honoured to host French Polynesia’s Minister for Primary Resources and Development, Mr Tearii O Te Moana Alpha, at its Centre for Pacific Crops and Trees (CePaCT) facility in Narere earlier this week. CePaCT is the Pacific’s only internationally recognised gene bank and houses over 2,000 tissue culture varieties, including the largest collection of taro diversity in the world. Over the past 12 years, the Centre has distributed over 70,000 tissue culture plantlets to 51 countries including 22 of SPC’s own countries and territories. SPC through CePaCT, responded to support the Agriculture sector in Fiji and Vanuatu following Tropical Cyclone Winston and Tropical Cyclone Pam in 2016 and 2015 respectively. These distributions of tissue cultures following natural disasters, ensure that farmers have access to screened varieties of crops, to rebuild farms often destroyed by these adverse climatic occurrences. Similarly, CePaCT will be working on developing a seeds distribution network by enhancing the capacity of countries and regional partners to provide easier access to seeds as required. During the tour of the facility, the French Polynesian Minister was given the ability to engage and view firsthand, CePaCt’s capacity to conserve genetic plant material, and to appreciate the centre’s potential to revive Pacific basic staples and crops which are constantly under threat by pests, diseases and changing climate. French Polynesia is currently an active member of the Pacific Plant Genetic Resources Network (PAPGREN) since its establishment in 2001. SPC has ongoing collaboration with French Polynesia through PAPGREN, with its most recent collaboration focused on the conservation of bananas by strengthening the network of collections in order to improve access to wider diversity and safeguard threatened banana cultivars. This collaboration has been facilitated in partnership with Bioversity International and The Crop Trust. Contributing to its wide collection of crop varieties, CePaCT houses 16 banana varieties and 5 taro accessions from French Polynesia in its regional collection, with previous distribution of bananas being facilitated by SPC CePaCT to the Pacific Banana Field Genebank housed in French Polynesia. 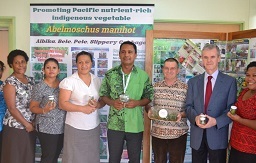 “SPC was delighted to host Minister Tearii Alpha to showcase our genetic resources facility as the Pacific mechanism to contribute to food and nutrition security in the face of impending Climate Change”, said SPC’s Land Resources Division Director, Jan Helsen. “The visit provided both SPC and the Minister the opportunity to discuss stronger partnerships in the region through the exchange of planting materials and the further development of planting materials. SPC’s genetic resources facilities could be used for the multiplication of some of the planting materials in French Polynesia”, said Mr Helsen. ‘“I hope to see a stronger partnership between French Polynesia and SPC that could be further exploited,” he added. The Honourable Minister echoed Mr Helsen’s sentiments in supporting the need for stronger relationships between French Polynesia as an SPC member country and the Centre for Pacific Crops and Trees. “We have heard of CePaCT’s work in French Polynesia around the conservation of vital crop varieties such as yam, breadfruit, taro and bananas. This laboratory is very important for us for the conservation of basic food varieties”, said Minister Alpha. “The conservation of local crops will be better for the security of plant varieties, especially with all the crop diseases present in the Pacific. We need to conserve our specific varieties for the future”, the Minister added.